Not Possible IRL: Fantastic ape avatar - Who made this? 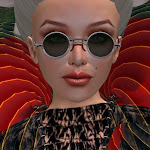 Second Life is a misery tonite... Now I've crashed, and logins have been disabled. 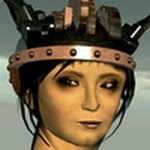 :( This would be bad news most any time, but tonite it is terrible because I had just discovered the most astounding avatar. His name is apes later, and he rezzed today: 4/4/2008. He doesn't speak... at least not to me. 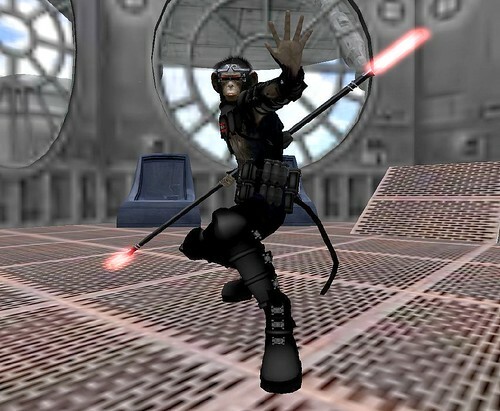 I found him at Privateer Space, and he was going through a series of precision animations with a long baton. The animations were perfection. But look at this avatar! Sadly, I was just about to film him when I crashed, and this is all I have. I tried to inspect his face, but could not. Is this a skin on an ape's shape? Who made this? The effect, I have to tell you, was mind-bending! One more shot, sadly a poor one... but I will post it here to give you a better idea. SO rad! must... find... out! 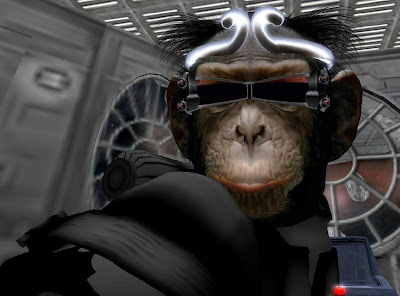 I have no idea if it's the same person but I met an ape that looked a LOT like that ages ago, but he was wearing a space suit and when he typed, he had an overrider that looked like a keyboard attached to his forearm. It was fantastic! I hope you find out! Aha, I believe I recognize that primate as the work of Ripped Winkler. Last I heard, he was selling them at his store in Sanchez, but that was last September. And yes the animations that go with it are amazing. I saw one of mk's friends wear an ape AV recently. The clothing was different but the face was the same. I'll try to find out more when logins are enabled again. Not sure if this is the same skin, but there's a wonderful and free monkey skin at the main store of 'about.' With the right clothes, the effect can be amazing. Both the monkey skin and those glasses have been written up at SecondStyle Men ( http://www.second-man.com/ ) in the past month. Significantly, Express, who blogged about the skin, implied that covering the skin's eyes significantly transformed the effect it had on people. Vision Enhancement is a good choice for that! I don't know about the crown/horns or the rest of the equipment though. The pose and staff remind me of things I've seen at Discord. I'd love know where those matte black boots come from -- very smooth. Thank you! You guys **so rock**. To wake up and find all these answers was sweeeet. As soon as all the planets align and it is possible for me to log in... I'll go investigate, now armed with your great info. When I do have it, I will post an update.